I’ve selected quotes that portray various perspectives that I found interesting, or at least balanced each other out. Our school was tiny, I enrolled with 80 other students. Now among them, there are soon-to-be Oxford lawyer, philosopher, scientist, Stanford computer scientists, MIT physicist, Columbia mathematician, Peking University historian; there are those who already got into The Foreign Ministry, Xinhua News, and various other crucial national organs. But we were not educated under the stereotypical Chinese education model. Self-learning, peer-critique, critical thinking were all essential in our school. We were encouraged to rebuke propaganda – and yes we were a school that commemorated June 4th; we had free press – student magazines, newspapers flourished; we had all sorts of student clubs, from the utterly ridiculous to student rights groups that often made direct demands to the administrators. Most importantly, all this happened despite the fact that the majority of our students had to take gao kao. To be honest, had I remained in the Chinese school system, I would never even have taken the Gaokao. My parents would have expended maximal resources in giving me preparation in a foreign language (and if they were well-connected they would know that German rather than English is an easier ticket for school admission), and ideally secured me a place in one of the nationally sanctioned foreign language schools.. and avoided the exam altogether, thus isolating me from hundreds of millions of potential competitors for opportunity. 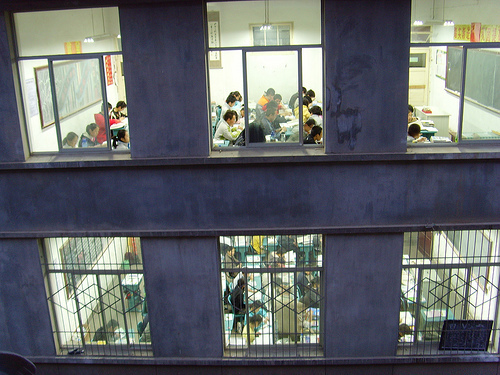 The anonymous reader blamed that China gaokao system is brutal. I got news for him: The reality in China is brutal. A population of 1.4 Billion makes any resource and opportunity extremely scarce. Yes, there are much unfairness in the exam system, i.e. Beijing and Shanghai got too many quotas for the colleges entries, minority groups got extra points, and some can get in based on their privilege and wealth. However, this system is the most fair and practical one compared to all other alternative systems. The American system including essays, reference letters, community service experiences…all too subjective and easy to manipulate in China. The privileged ones will benefit even more from American system and squeeze the poor talented ones out of the best schools. For more, see Fallows’ education-related posts.